Shims. These are little pieces of wood that you purchase when the floors in your old house slant in three different rooms. I know this because we now have them under most of our furniture in an effort to combat the “funhouse” effect. In the photo above, ignore everything except the thin leg on that piece of furniture and notice where it meets the floor. See the little squares of wood? Now you know what shims look like. People ask how the house is coming along and I’m never sure what to say. “It’s coming,” is usually my answer. The boxes are unpacked, which is an accomplishment, but the furniture has been moved and rearranged and ultimately judged as too big to fit into most of our downstairs rooms. Our pieces have puffy arms and they are ridiculously deep and wide, so we’re in the process of downsizing most of our furniture, which wasn’t in the plan. It feels like we’re in house survival mode – troubleshooting weird problems we couldn’t have predicted and discovering strange quirks that the house has been hiding since October. These are small problems in a big world, but this is the world we happen to be living in right now on Rosedale Avenue. This is my first go round with an old house so I’ve been looking at photos of other homes that have been renovated and resurrected. At first it was fascinating and inspiring, and then it wasn’t. After so many images of sterile, stylish, bright and white rooms, I wanted to see a little reality. I wanted to see the shims. Or at least some evidence that somewhere in the midst of the perfection, there was a little pitch in the floor. We have varying degrees of slanting floors in three rooms in our house and there is nothing we can do about it. 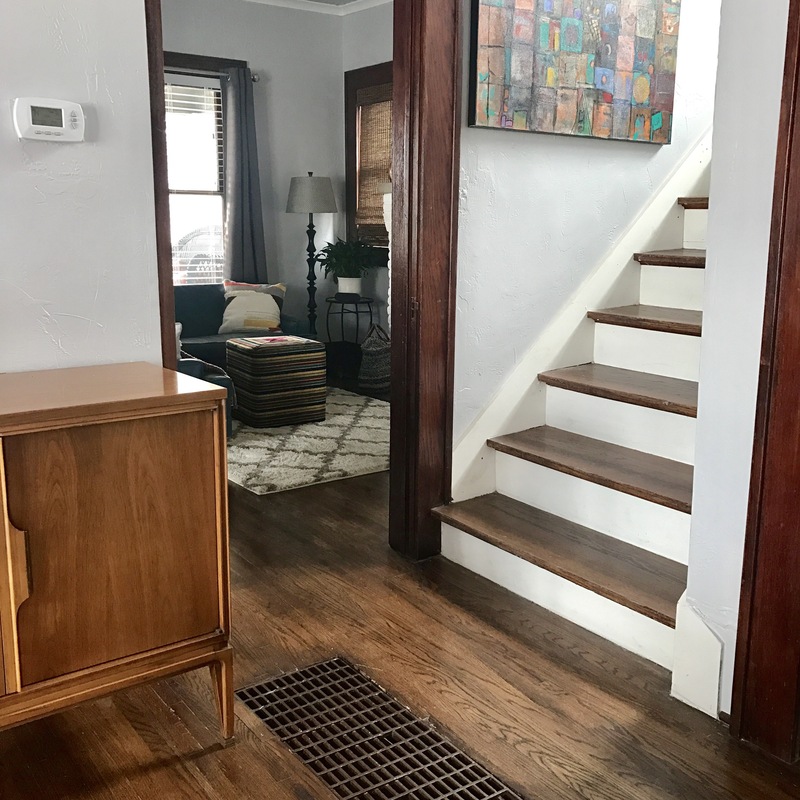 We gutted the kitchen and the master bathroom to redo ugliness and former botched remodeling projects, but the floors are not a fix-it project. The eight-foot opening into the dining room has an obvious sag in the middle. The garage is not fit for cars or humans, but the feral cats love it. We store our junk in it and pray that the Oklahoma wind won’t level it. There is no grass in the backyard, but there is dirt, scattered clumps of weeds, and an overgrown Koi pond that perpetually and mysteriously holds water, even during weeks without rain. The windows are original and drafty, and there there are no two the same size. Also, I now know the train comes through with a blaring whistle between 4 and 5 a.m. While this may all sound like petulant whining, it’s not. This is enlightenment. Everything that will never be fixed in this old house is part of what makes it good. This is a new concept for me, because I like perfection. But perfection is stressful. It’s also impossible to attain, and it makes us competitive and sorrowful with our sad self when we look at photos and posts of lives and houses that seem void of flaws. Perfection makes us lament what we don’t have and feel a tiny (or looming) resentment toward those who appear to have acheived it on some level. We want everything in our line of vision to be tidied up and nailed down, clean lines and sharp edges. White and bright. That’s my problem. If it’s yours, I have some news. No one, including you, wants to hear the perfect story. It isn’t interesting. It doesn’t move us in the deep places or draw us toward one another. What we want to hear instead is a good story – the one where your husband, while digging out the Koi pond in the backyard, finds a trash can with rocks in it buried four feet deep in the ground and almost gives himself a hernia pulling it up from the depths. This is the project that doesn’t get finished in an hour, or a day. Probably not in a week. A month? It’s messy and sloppy and ugly. It’s good. It’s life being lived and humans making the best of it. In the Hebrew language, the word for this is tov. It’s the kind of good that isn’t perfect, but instead embraces the darkness and hard moments, knowing there is also joy and light as well. And then the Greeks gave us a view of perfectionism with their statues and Olympics. Perfection was striving to be the ultimate human, which actually takes us far away from our humanity, and from what feels like home. Anne Lamott says that perfectionism is when we try desperately not to leave so much mess to clean up – and yet it is the clutter and mess show that us life is being lived. This is the good story. Because we are all a bit of a mess, you and I, and we should have the freedom to live out our good story without the burden of making it a perfect story. If you visit my house, I’m going to show you the sloping floors and the sagging doorway and the disastrous backyard. Oh, and the window seat in the dining room, which I’ll leave to your imagination. And I’ll show you the shims, beautifully stained so that they will blend in with the wood floor – our feeble attempt to clean up the mess. Come over and I’ll tell you the good story, because that’s the one that carries us home. Our children all own homes with great character…the kind that comes from having been around a long time. Sometimes I envy them…but Jay and I know that there are always opportunities for us to help them shim a few things! Your house may not be perfect, but it’s perfect for you, I know.